Wisteria offer breathtaking beauty and scent flowering in a selection of white, purple an pink colours, are beautifulidea for covering walls and trellis. Wisteria can live a long, healthy life with no pruning at all, happily twining, climbing, and sprawling over everything in its path. But for Town houses with limited space a pruning routine becomes a necessary. Wisteria needs regular pruning to keep its growth and size under control as it grows incredibly vigorously by as much as 3 metres in one season. For optimal results wisteria will benefit from careful pruning typically in January or February when the plant is dormant and then in July or August when it sends out long wisteria shoots. Dedicated training will also keep the vine and display in tip top condition. 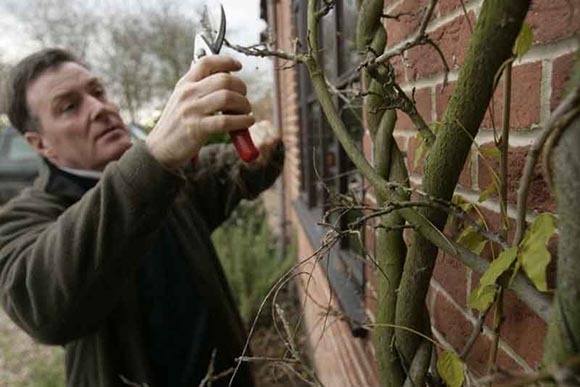 Pruning wisteria is a specialist trade, as prune it too little and the flowers will be small, or prune the wisteria too severely and risk losing all the flowers. However, pruning of the wisteria correctly will improve the flowering display, producing more and larger flowers. Caring for Wisteria often involves working from ladders or steps and these must be treated with respect. Whether you need a one-off visit to prune a Wisteria or a year-round maintenance programme, we tailor our services to your individual requirements.